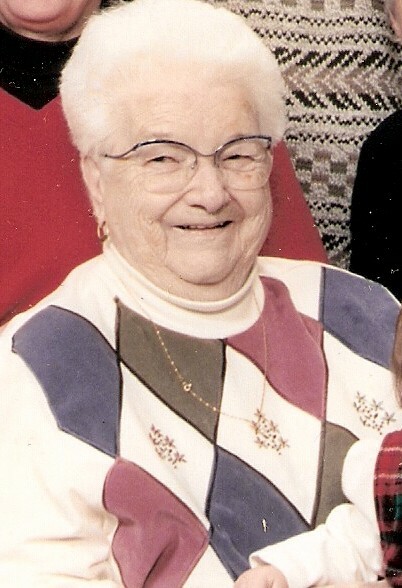 Zella M. Peters, 99, formally of Madrid, died, September 2, 2011, at Highland Nursing Home, Massena, Allen-Denesha Funeral Home, DeKalb Junction, in care of arrangements. A graveside service will be held on, Tuesday, September 6, 2:30 PM, at the Brownville Cemetery, Brownville, Reverend William Hart officiating. Zella is survived by, sons P. Sanford (Patricia) Bacon, DeKalb Junction, Larry V. (Rebecca) Peters, Madrid, Lonnie W. (Sherry) Peters, Trion, GA, daughters, Joyce Coller, Potsdam, Beverly J. Daniels, Madrid, stepchildren, John (Rosemary) Peters, AZ, Joseph (Donna) Peters, DeKalb Junction, Donald Peters, TX, a sister, Ida Farmer, Adams, 9 grandchildren, many great and great great grandchildren, a nephew, Vincent G. (Agnes)Farmer, Binghamton, and many cousins. She was predeceased by stepdaughters, Mary Lou Peters, Betty Hundley and Margaret Carvel. Zella was born September 21, 1911, the daughter of John and Edna Shultz Lancto. She attended Antwerp Schools. Zella married Ellwyn P. Bacon on December 28, 1929, which ended in divorce, she married Leon B. Peters in March, 1951, he died on June 14, 1981. She was a nurse’s aide at the Orlando Regional Medical Center, Orlando, FL, for more than 30 years, retiring in 1993. She enjoyed spending time with her family, knitting and reading. In lieu of flowers contributions can be made to the DeKalb Historical Association, Old Methodist Meetinghouse Museum, 696 East De Kalb Road, De Kalb Junction, NY 13630.